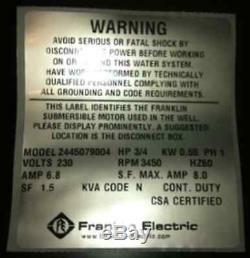 FRANKLIN ELECTRIC 4" 2-WIRE SUBMERSIBLE WELL PUMP MOTOR (This is just the motor not a complete pump) (for use without control box, if you have a control box you can eliminate it using this motor) Fits Most 3/4 Horse 4" Pump Ends! Specs: Model #2445079004 3/4 Horsepower 230 Volts 3450 RPMs Amps 6.8 SF Max Amp 8 1 Phase KVA Code N S. 1.5 Continuous Duty Thermally Protected Equipped with Lightning Arrestors. Comes with factory installed 4 ft. 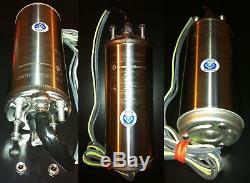 The item "Franklin 3/4 HP Submersible Well Pump Motor 230v NEW" is in sale since Wednesday, June 9, 2010.